Dead Air is a full-scale S.T.A.L.K.E.R. modification based on Call of Chernobyl. It changes all aspects of the game, from graphics, audio, and special effects to various gameplay and AI features. 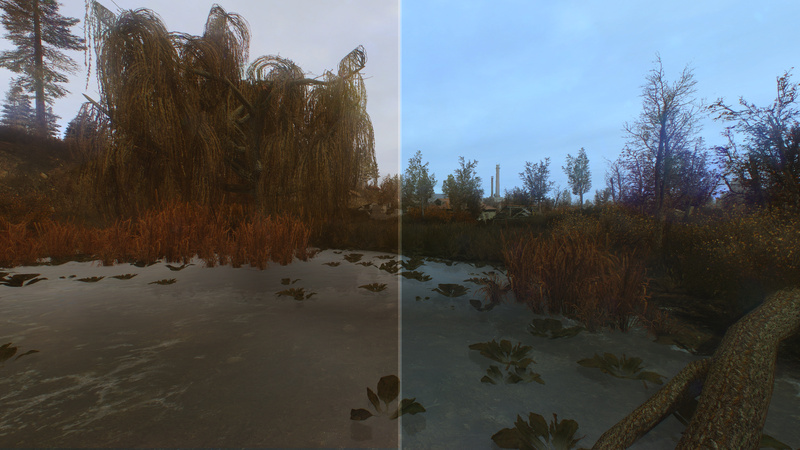 The modification evolves from the ideas started in Call of Misery, a previous project from the mod’s author. Major inspirations for Dead Air have been projects such as NLC, MISERY, Autumn Aurora, and OGSE. Dead Air prioritises the development of the game platform’s potential, gameplay complexity, and attention to detail, along with addressing both the quality and quantity of all content. It’s been a long time since any news was posted about this project for English-speaking audiences, but Dead Air, a new free-play modification based on S.T.A.L.K.E.R. : Call of Chernobyl, is very much alive and well. Dead Air Team has publicly announced and revealed a multitude of features and information regarding the upcoming project! Campfires now properly work on all renders (previously, R1 users had been experiencing static, ever-burning campfires). The Burnt Fuzz anomaly and environmental glass now also work properly with R1 and do not appear in bizarre colors anymore. Grass during foggy weather cannot be seen through the mist over large distances. I think I just had an emission in my pants! Damn, looks so good. Awesome work! Wow, amazing. Glowing sticks - extremely useful ftw ! Interesting question. It's because of the keybinds that end recording for Nvidia Shadowplay. Is it possible to wrap raw mutant meat in paper to stop it from irradiating me? Is the summer flora a separate download? If so, where is the link? It just keep says that X ray 1.6 engine stopped working. Can anyone help? Had the same problem, drove me nuts for about an hour until I figured it out. If you msi afterburner/riva tunner/razer synapse installed turn off all of them, then the game should launch. Hi. Find or buy a dosimeter, and check the dose of radiation . Is it Call of Chernobyl or Call of Prypyat mod? Call of Chernobyl. But the original version of CoC is not required. Where is the main download file? Is it possible to wrap my mutant meat in Paper, so it stops irradiating me? Great work guys you dun a proper good job. Also, i couldn't help but notice that the mn91 sawn off is practically decorative, since it has no dicernable difference from the full size rifle. Maybe you should make it a tiny bit lighter and increase the handling attributes. Anyone have the link to the official page? Thanks. Where can I report some bugs that I have noticed in the game? I suppose the stealth system .ltx in CoC/DA is in a folder similar to CoP, so I will ask a question. Where could I find this .ltx?